) that allows you to set the maximum number of times a calculation with a circular reference can take place. 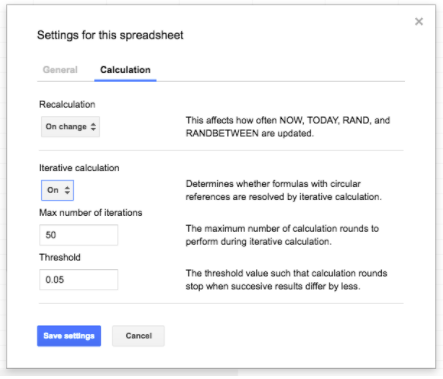 In addition, you can specify a “convergence threshold,” and when results from successive calculations differ by less than that threshold value, the calculations will stop (even if the maximum number of calculations has yet to be reached). Over the course of the week, we’ll make additional improvements to your Sheets experience on the web and Android devices. First, we’ll update the Sheets Android app UI to make it easier for users with right-to-left language settings to read and navigate. 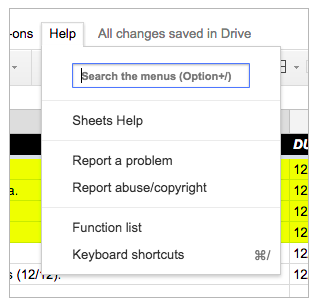 Second, we’ll make it possible to search the menus in Sheets on the web, much like you can in Google Docs and Slides. For more details on these features, please visit the Help Center. To prevent the errors that sometimes plague complex calculations, today we’re launching a new setting in Sheets on the web (File > Spreadsheet settings > Calculation > Iterative calculation) that allows you to set the maximum number of times a calculation with a circular reference can take place. In addition, you can specify a “convergence threshold,” and when results from successive calculations differ by less than that threshold value, the calculations will stop (even if the maximum number of calculations has yet to be reached).